Keep Calm and Fly Fish: For Science! One of my goals this year is to learn how to throw dry flies and swing flies with better success. I've been doing the latter a bit with some luck however I can't say I've gotten the hang of it yet. One of my other goals was to learn more about fly fishing in general and with that being said I've gotten rid of my neon tetras in favor of aquatic insects. 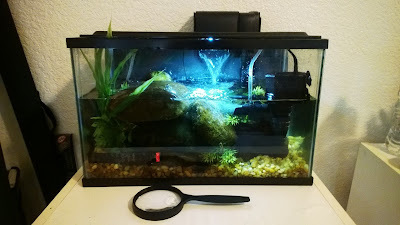 A few days along I converted my 5-gallon neon tetra tank into an aquatic insect tank. To imitate a cold fast flowing streams I left the tank half full so that the filter drops water, added both a powerhead pump and a long airstone, and occasionally throw in a frozen water bottle in the water from time to time to cool it down. In order to simulate a natural stream there needs to be a high level of dissolved oxygen. High levels of DO are necessary to ensure the survival of aquatic insects. The frozen water bottle, powerhead pump, airstone, and falling water from the filter all contribute in adding the necessary amount of DO for the tank. So far the project is coming along nicely. The aquatic insects I've collected come from the Yuba. 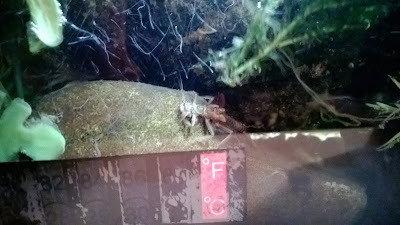 There are a variety of insects in the tank ranging from mayflies, caddis, stoneflies (specifically skwalas), and midges. Before I added the powerhead pump the insects that thrived were the mayflies. The caddis and stoneflies had the most difficult time adapting. After I added the powerhead pump the caddis are now doing a lot better however the stoneflies are still dying off a few at a time which is interesting. My tank temperatures fluctuate a bit because I don't have an aquarium chiller but I haven't seen any real effects from the temperatures going from 19°C to 23°C. These bugs need to be pretty tough in order to survive a hot summer on the Yuba therefore most have adapted to higher-than-average water temperatures. I will continue to monitor my tank in order to learn more about how these aquatic insects live and interact. 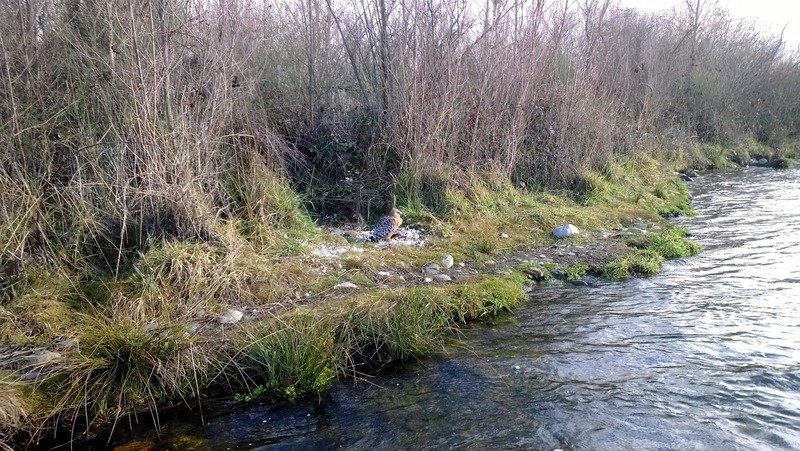 The hatchery section of the Feather River above HWY 70 bridge opened on January 1st. Although I didn't get to it opening day, I fished it this week along with a few other anglers. From what I've gathered online there haven't been very many fish being caught although they are in there. Swinging was the name of my game. I switched through a lot of flies but the combination that got bumped the most was a woolly bugger and baetis nymph. I saw a few anglers that were nymphing hook up but other than that not a lot of fish being caught in this section today. I couldn't find any alevins along the edges but the birds were eating something... Maybe I'll give it a few more weeks before I head out there again. I managed to land one smaller fish below the bridge so the day didn't go totally fishless. 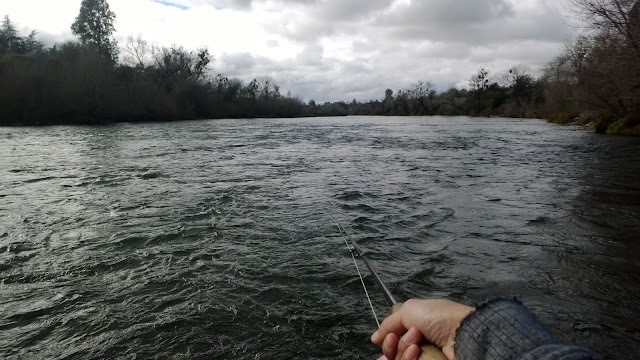 The Yuba got flushed a few days ago with Deer Creek hitting near 500 CFS. I took my brother, who nymphed while I swung, along this trip and despite the tint in the water we got skunked. Reflecting on how the day went, I went home and checked the flows online and noticed that the water was dropping super fast the day we went out. Most of the fish were probably scrambling around looking for the best spots to hold before the flows leveled out. Going from 1100 CFS to 650 CFS in a day and a half will do it. Really like your blog. Thanks for the great info. I've been planning on trying to make an aquatic insect aquarium as well. Has your setup continued to work well since you posted this? Are you doing anything differently now? Your comment inspired me to write a quick post about my aquarium setup. I hope you find the information you're looking for in that post. If not, feel free to leave a quick comment and I'll do my best to answer you.